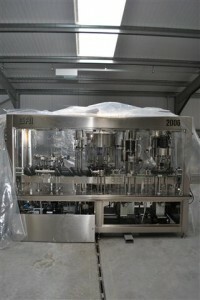 The business end of Hush Heath’s new bottling line has arrived to be installed and commissioned over the next few weeks. Truly versatile, it is capable of filling anything from 25cl to champagne magnums . Its is equipped to use cork,screw-cap and crown caps and will be used to bottle the 2010 Hush Heath vintage of Balfour, Nanettes English Rose, and a couple of other surprises.